The Malvern Hills form a north-south range about 14km (9 miles) long. 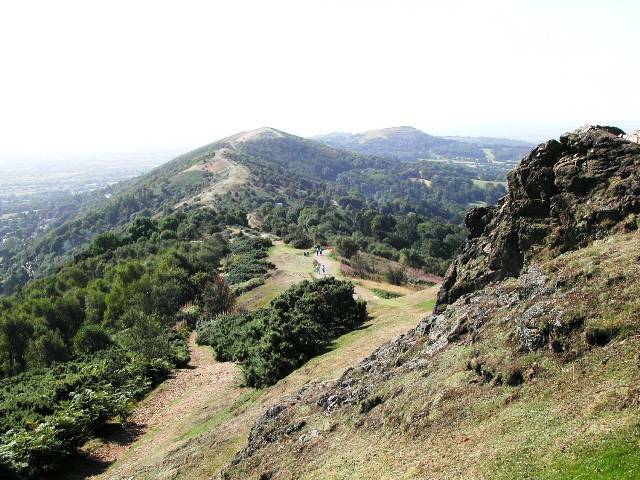 The rocks of the Malvern Hills consist of igneous and metamorphic rocks collectively referred to as the Malverns Complex. They are the oldest rocks in the Geopark having formed about 680 million years ago (Precambrian). Travel back in time to the Precambrian and the position and shape of the continents was completely different from today. The Geopark sat on the northern edge of an ancient supercontinent, which we call Gondwana, at approximately 60 degrees south of the equator. 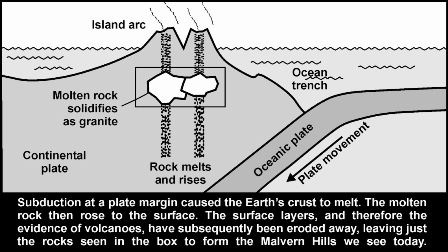 The Malverns Complex formed beneath a volcanic island arc, a situation like that of the Pacific Rim today. Here, tectonic plates (part of the Earth’s crust) collide and one plate is dragged under another along a subduction zone. The rocks of the descending plate are subject to intense heat and friction and melt to form magma. Some of the magma reaches the surface to form volcanoes (extrusive igneous rocks) but if it solidifies deep within the crust, as with the Malvern rocks, it forms intrusive igneous rocks such as granite. The surface layers, and therefore the evidence of volcanoes, have subsequently been eroded away, leaving just the rocks seen in the boxed area of the diagram to form the Malvern Hills we see today. The rocks consist of assemblies of interlocking crystals with generally irregular shapes. The size of the crystals depends upon the rate of cooling of the magma; slow cooling generates larger crystals (up to 20mm in the Malverns) while very rapid cooling may yield extremely small crystals. The crystals are mainly of three types of mineral; quartz is grey in colour and is translucent; feldspar is either pink or white depending on chemical composition; dark crystals of many types occur and usually contain much iron or magnesium. When not severely weathered, the colour variation often gives a mottled appearance to the rocks.